In this category, the MDI is the clear frontrunner. It's compact, it's light, it has an optional carrying case about the size of a suitcase, and you can take it off its stand to use it on any table you want. It takes up the least room of any mini C we've seen. If the nature of your imaging needs includes travel, or if your practice has tight space constraints, the MDI can accommodate those needs well. When it comes to positioning, the FD has the advantage. Because the C is mounted on a fully-articulated arm, the FD can be moved into any position necessary. The MDI, on the other hand, is limited to up and down movements and side-to-side rotation. Because of its superior positioning capabilities, the Orthoscan FD is better suited for surgical use than the Orthoscan MDI. It should be noted that the MDI offers an added positioning bonus for weight-bearing foot and ankle scans. There is an MDI accessory that is essentially a radio-translucent footstool that covers the detector while the patient puts their weight on the limb. If you are hoping to use your mini for surgeries, the FD has the monitors you'll want. They are surgical-grade and suspended on an articulating arm that accommodates the positioning needs of surgical use. The monitor arm on the MDI's rolling stand is listed as "non-surgical" and is capable of fewer movements. If you're looking for monitor flexibility for basic scanning, the MDI has the option of using a tablet accessory as your monitor. It also has a video output that allows you to connect it to an external monitor of your choice. This is especially handy if the unit will be moved between offices/clinics. On the refurbished market, these systems are in the same price neighborhood, $45,000 - $49,000. There is, however, a significant cost difference between new units. New MDIs cost around $60,000 - $63,000 while new FDs run $80,000 - $83,000. 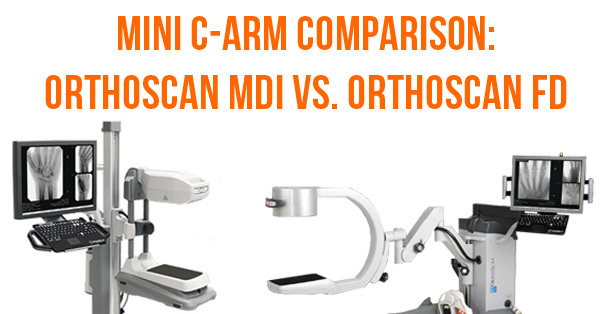 The Orthoscan FD and Orthoscan MDI are both quality mini C-arm systems that produce clear digital images and offer flexibility for a variety of practices. The decision to choose one over the other can only be made by carefully considering the type of work you'll perform most often, the space and layout in your facility, and the constraints of your capital equipment budget. However you may be leaning, or if you'd like to know more, our team is ready to work with you and find your best fit. Contact us below and tell us how we can help. Gary Dodge is a C-Arm Product Specialist at Block Imaging. 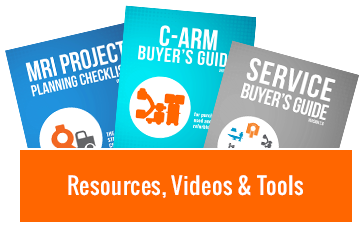 His role is to help C-arm buyers select their best equipment fit with confidence. Outside the office, Gary is a father of five and an outdoor sports enthusiast, enjoying the swim, run, and bike disciplines of triathlon.